Home beauty beauty industry black hair hair hairstylists Why Do Non-Black People Act Like It's So Hard to Do Black Hair? Why Do Non-Black People Act Like It's So Hard to Do Black Hair? 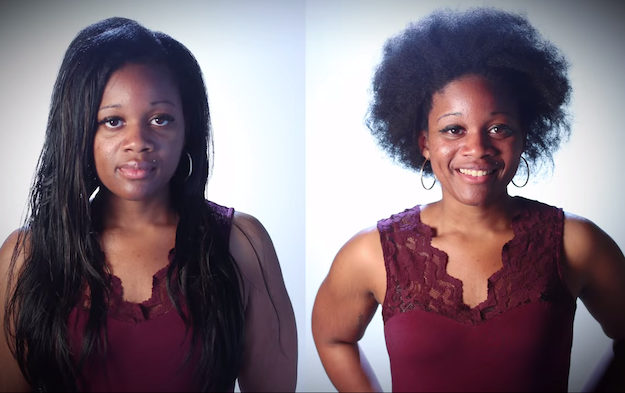 A recent Buzzfeed video, “Powerful Hair Makeovers that Transforms People's Lives,” showed seven clients, from a variety of racial backgrounds, participating in a hair transformation that would dramatically change the way they looked. They all wanted the transformation for different reasons. Some felt their hair was a burden. Others wanted a change from hairstyles they’d rocked for years. All of them were dissatisfied and simply wanted something new, feeling it would boost their confidence and change the way they showed up in the world. By the end of the video, each of the ladies had truly transformed, except one. Daysha wanted a something low maintenance that would require less work. Her ‘before’ photos showed a number of hairstyles that looked amazing, but the ‘after’ shot left much to be desired. The stylist helped the other women with hairstyles that completely transformed how they looked. Overall their hair looked full, lush, and healthy after the change. In contrast, with Daysha’s hair, the stylist only removes her weave and gives her an afro. Hundreds of people on Twitter found this unacceptable. Some said her afro was clearly not trimmed and reflected the stylists’ lack of competency when it comes to Black hair. In this case, it is not a matter of the women of color being treated ill. The Latino and Asian women were both taken care of and their styles reflected this. In Daysha’s case however, the lack of trim and overall appearance of her hair indicates carelessness on the part of the stylist. Regardless this issue has been something that has been brought up time and time again. Most hairstylists of black hair are black. Some black person have trouble finding stylists in their city. The issue of finding a knowledgeable stylist also occurs often with interracial couples, or adoptive families who have black children. This lack of knowledge on how to do their child’s hair leaves them looking unkempt at best. The central concept here is that black hair is the nexus of Black culture. It connects in a major way to other aspects of our lives and is a major key to celebrating ourselves. Not only does neglecting to learn about black hair say a lot about the incompetency of the stylist, it also demonstrates how they shun our culture and treat it with carelessness. Fortunately, there are a number of outlets designed to help white mothers with black children learn about black hair and a number of other issues that white parents have to come to terms with, such as racism and police brutality. All in all, it pays to learn about Black hair and other aspects of Black culture. There should be required curriculum in place that teaches both white and non-white people of color how to style black hair. This would reflect a nuanced concern for our culture, leading to respect for our boundaries such as why it’s not okay for people to touch our hair without our permission- as well as how to better honor our hair. The hairstylist chair is known to be a place of dialogue for black people. By using this as a medium as a nexus for connection, we can begin to bridge the gap between our cultures. Anna Gibson is a freelance journalist, Buddhist, and student at Wayne State University in Detroit. She likes to create a space for the marginalized to tell their stories. If you want to talk to her because she’s awesome you can reach her on Twitter @TheRealSankofa or on Facebook where she’s hiding under the name Introspective Inquiries.